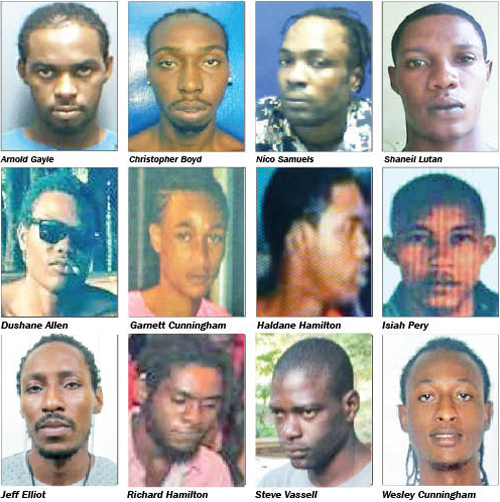 With all of St. James now under the militant grip of the security forces under the recently declared State of Public Emergency, the St. James police, with full military support, have renewed their calls for the parish’s Top Five Most Wanted Men, who have all contributed to the bloodletting now being seriously tackled in the tourism capital. The Wanted Men, whose crimes include murder, as well as a range of other serious offenses, are being asked to turn themselves in immediately. Known to be from Farm Heights, St. James, the police are imploring 27-year-old Shaneil Lutan, who has been convicted of two counts of murder and illegal possession of firearm, to turn himself in. Though Lutan was held by police, he escaped police custody and has since been on the run. Another known murderer, Delano Wilmott, is hot on the radar of the St. James police. Wilmot, also known as ‘Prekeh Bwoy’, hails from Mother Lane in one of the communities increasingly being impacted by crime, Retrieve, St. James. The Wanted Man is being sought for the murder of Mark Williams, who was killed in 2016. Wanted for the 2016 murder of Christopher Currie, the police have fingered Arnold Gayle, otherwise called ‘Guy’, as the next person on their infamous list. Making the final two on this list are Nico Samuels, otherwise called ‘Bowza’, and Christopher Boyd, otherwise called ‘Plank’. Just last year, 2017, the two men accounted for 5 murders, with Boyd recording a triple murder, and Samuels recording a double. With the security forces now experiencing a surge in power granted by the declaration of the Prime Minister, efforts have been significantly ramped up in the parish for the capturing of these men. Anyone with information that can assist the police in catching these fugitives is being asked to contact the Montego Bay Criminal Investigation Branch at 953-6191, Crime Stop at 311, via the Tip line at 837-8888, the police 119 emergency number, or the nearest police station. Over in the crime-riddled hotspot of Westmoreland, the police are bracing themselves to wrest the once peaceful parish back from the hands of criminal elements, despite not having the boost in manpower St. James now has under the State of Public Emergency. Last Friday, the Westmoreland Police Division released a list of the parish’s Top Ten Most Wanted Men, wanted for a number of serious crimes and offenses. First is Dushane Allen, otherwise called ‘Nigel’, who is known to frequent the Greenwich district in Bethel Town. Allen is wanted for three murders, committed between July of 2016 and February of 2017. On July 9, 2016, Allen murdered Tevon Lewis, and exactly a year later, on July 9, 2017, he killed Omar Garden. In February of that year, Stephen Hibbert was added to Allen’s body count. Next is Wesley Cunningham, who is known to frequent Bethel Town in Westmoreland, who is wanted for the double murder of Garfield Francis, otherwise called ‘Braun’, and Kenroy Vassel, otherwise called ‘Bash’, committed on July 18, 2017 at Lambs River, also in the parish. Burton Shearer is the other man on this list. Shearer, otherwise called ‘Bap’, is wanted for the murder of Fabian Cooper, otherwise called ‘Yellow’, which was committed in the parish at Church Lincoln, Grange Hill on October 16-2016. Two men, Richard Hamilton, otherwise called ‘Brutus’, who is known to frequent Paul Island, Grange Hill in Westmoreland, and Garnett Cunningham, of Bethel Town in Westmoreland, are responsible for the deaths of Garfield Francis, otherwise called ‘Braun’, and Kenroy Vassell, otherwise called ‘Bash’. The men were cut down on July 18, 2017 at Lambs River. Next is Haldane Hamilton, otherwise called ‘Fishy’. Hamilton is known to frequent Paul Island, Grange Hill, Westmoreland, and is wanted for the murder of Steve Spence, otherwise called ‘Iyah’, committed on September 17, 2017 in Paul Island. Donavan Roach is next on Westmoreland’s Top Ten Most Wanted list. Roach, otherwise called ‘Tim’, is known to frequent Bethel Town, Westmoreland, and is wanted for a case of wounding committed on Wednesday, June 14, 2017 at Barney Side district in the parish. Steve Vassell, who escaped police custody, is next. Otherwise called ‘Bus Mi’, Vassell hails from Shortwood Road, Kingston 8, and Roaring River in Westmoreland, and is also wanted for murder. Isaiah Perry, or Matthew Perry, otherwise called ‘Cat’, and Jeff Elliot round out Westmoreland’s Top Ten Most Wanted list. Perry, who is known to frequent Kings Valley district, Grange Hill, and Elliot, who is from Alma district and Delveland, Westmoreland, are both wanted for murder. Anyone with information that can assist the police in nabbing these men are encouraged to contact the Savana-la-Mar Criminal Investigation Branch at 955-2758. With St. James and Westmoreland both experiencing record spikes in crime over last year, both parishes’ police divisions are determined to put a dent in crime figures this year, and will be relying on the public to play its part in assisting them with their investigations, even as other means to curtail crime are being pursued.